I am in love with this dress!!!! It was so simple and easy to make. I used one of my favorite patterns, Pretty Peasant from SquigglyTwigs Designs. If you scroll down on the page you will see Cailey modeling the peasant top I made with this same pattern. 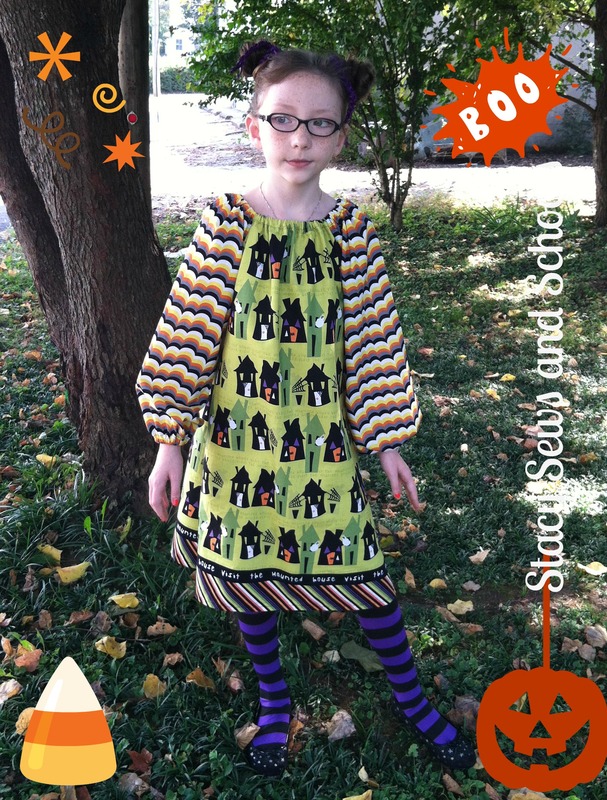 We are going to try the dress with her orange and black tights, too! LOL Such a FUN dress for the season! Adorable.. i love the peasant dresses.. So cute. The mixing of the fabrics, just made it..
And the adorable model , just adds to the cuteness. Best wishes on the costumes. I made Emily a poodle skirt, [she is in the 9th grade and is having homecoming week, and she had to dress in the 50’s]. Now the other 3 granddaughters is wanting one……oh me!!!!!!!! I don’t sew, I just had to come over and tell you that she could not be cuter in that dress! PRECIOUS! Girl – this is boutique quality… I have mama friends who spend ridiculous amounts on clothes that look like this – I think you have a business in the making! 🙂 TOO STINKIN’ CUTE!!! Thank you SO much, Heather!!!!! Really cute and fun dress… Love her nails too!